The view of Lake Slano from above and the road that twists and turns through the mountains between the Bay of Kotor and Niksic in northern Montenegro. My plan is to meet Goran Radevic at the Radevic Estate Winery at 2:30. I carry all my bags down the steps from my Admiral Apartments in Perast. There’s an ice cream delivery truck blocking my bike. It’s a sign I should sit and have an espresso, or two, and enjoy the view before heading toward the Montenegrin capital, Podgorica. I go the long way instead of riding through Budva or taking the tunnel. The views of the northern part of the Bay of Kotor are stunning and reveal hidden bays and other towns clinging to the hillsides. There are few cars, and with sweeping turns and perfect tarmac, it’s a joy to be riding. 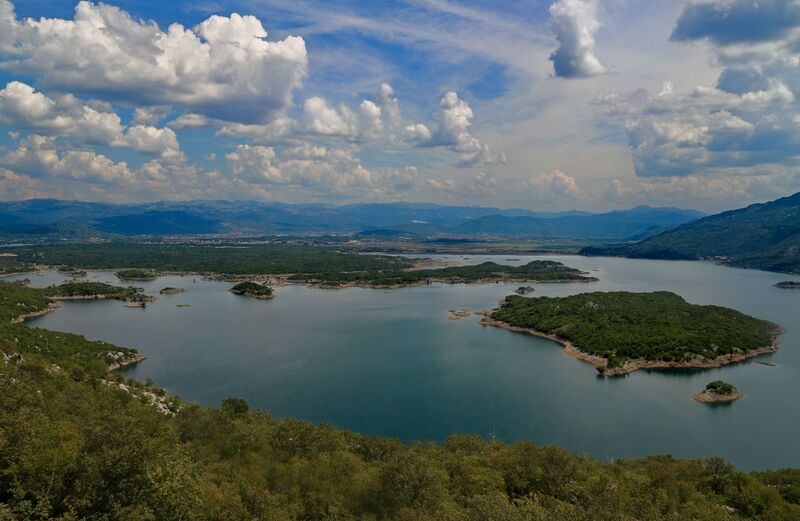 I wind my way toward Niksic, and as I descend into the eastern valley, I am treated with views of Lake Slano, and the many dark green islands that dot the landscape. The lake isn’t natural, but that doesn’t diminish its beauty. It was formed in 1950 as a result of a recently constructed dam and the Perucica hydroelectric power station. I love stopping by roadside stands where enterprising and very patient locals wait for passersby to stop and buy the locally grown and made treats. Here above Lake Slano the funny and gregarious merchant doesn’t speak English but has plenty of passion and a smile to go with! About 15 kilometers north of Podgorica, just as the dark clouds hovering above leak drops of rain on Doc and me, my GPS guides me off the main road, through a few tiny towns, and winds me around a massive corn processing plant. I guess I must be close. I’m happy that I’ll be at the winery before the drops turn into a rainstorm. The road follows along narrow-gauge railroad tracks, and the foliage grows denser while the road narrows. Corn fields rise above me, and my gut tells me I should either be on the other side of the river which runs to the west, or the railroad tracks to the right. I feel like I’m entering more rural countryside rather than the outskirts of the capital. So I stop at a minuscule store and ask for help. Nobody knows Radevic, but they agree I’m on the right road. Ten minutes later my GPS tells me I’ve arrived. I notice vines outside a house along the river, but it hardly looks like the photos on the Radevic website. So I call Goran for help. I follow his directions but get lost again. He tells me to ride past the corn processing plant, and soon I’m back at that tiny store. Goran meets me there, and I follow him to the real Radevic Estate. We cross over railroad tracks and ride up a gravel road for about 300 meters. An automatic gate opens as I drive onto the estate which consists of three or four structures situated around a large stone estate, the building that graces the label of the estate wines. 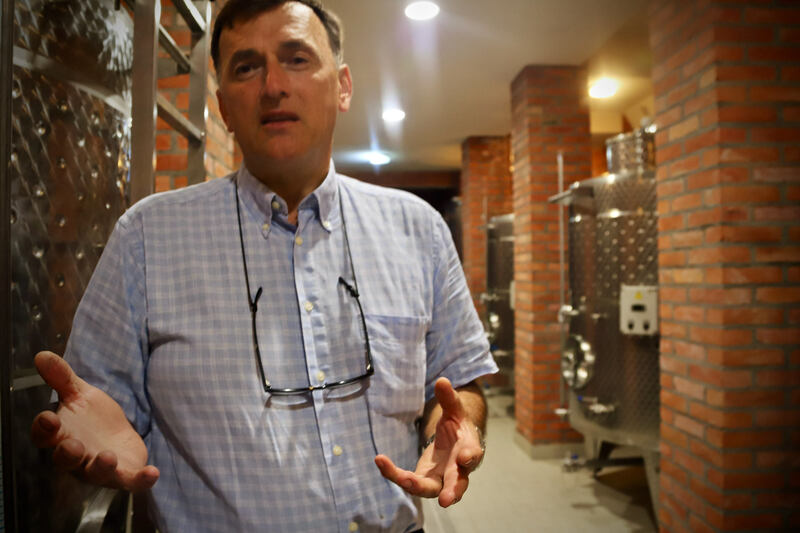 Goran Redevic exudes passion and quality as he takes me through the meticulous and clean Radevic Estate Winery & Cellar. “For three years I have waited for the permit for the sign,” Goran tells me. I sense he’s annoyed that people have a hard time finding the property “It’s already made,” he asserts swiping through a few photos of it on his phone. Thunder booms and crackles as we talk outside the wine cellar and winery. The Radevic family, or clan, lived on this property dating back to 1604. But Goran left the area after completing one year of mandatory military service. He studied medicine in Belgrade, the capital of the former Yugoslavia republic. Trained as a trauma and emergency room (ER) doctor, he first moved to China where he continued his education in acupuncture and neuroscience while learning to write and speak Chinese. 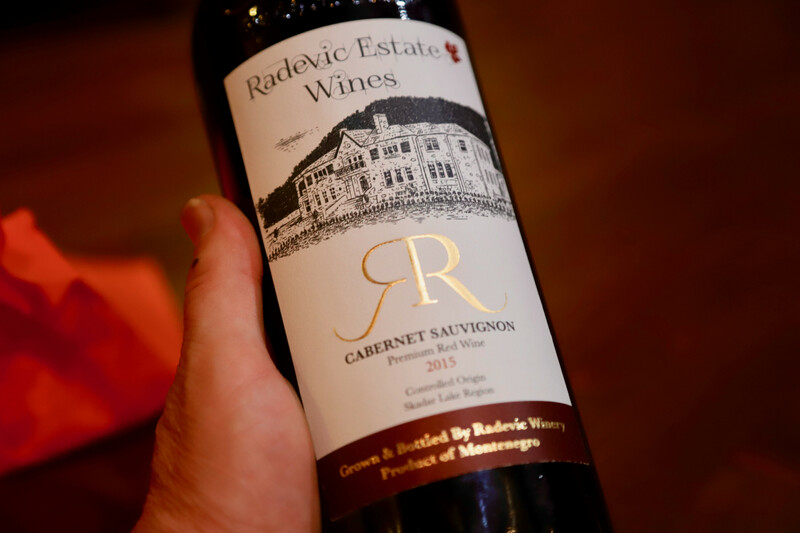 Radevic Estate is a gorgeous home built of stone and like the great estates of Bordeaux, a drawing of it graces the label of Radevic Estate wines. “Like you, Allan,” he relates, “I wanted to travel the world.” He moved to South Africa where for four years he worked as an emergency doctor. He then started the first emergency trauma center in Oman before settling down and serving Her Majesty’s Service as a doctor on the Cayman Islands in the Caribbean. During the eight years, he lived on the Cayman’s he met fell in love and married Renee, an American living in the Caymans, the second marriage for both. “I was on a treadmill,” Goran reveals. Explaining his belief if something didn’t change he’d burn out or the stress would kill him. In the fall of 2005, Hurricane Ivan nearly destroyed the Cayman Islands. The storm demolished his home. Devastated and with two young children from the new marriage, Goran didn’t abandon patients and those injured in the hurricane. Instead, he stayed several months and provided medical care for the locals. 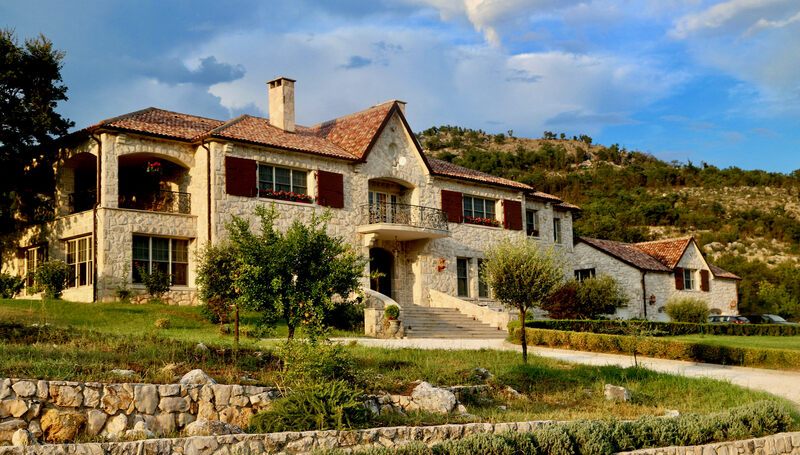 Later, the couple moved to the United States and then to Goran’s homeland in Montenegro where he tended to old vines and planted new on property outside the Montenegro capital, Podgorica that has been in the family to 1604. “We are the 26th generation on this land,” he tells me. The hillside estate vineyard gently slopes down to the new wine cellar completed in 2013, and next to the estate home that is featured on the Radevic wine label. “I had ten bins,” Goran explains. “They were 1,000 liters each, and I had to punch down with the hands. To break the cake,” he says referring the cap, or the skins that rise to the top of the juice during fermentation. Goran tells me that he learned to make wine from his grandfather, a priest and who lived on this land until he was 103 years old. “My grampa.” Goran explains, “is responsible for my love of grapes and winemaking.” Goran was grafting grape vines before he could read and write. This passion for wine followed him through the years. To find relief and peace from the stress of his job as an emergency room and trauma doctor, Goran would dream of living on land with a small vineyard and a small house and spend days working in the vineyards. For vacations, he would always travel to the famous wine regions of the world. He would ask questions, observe winemaking techniques, and taste wine. Today Radevic Estate harvests 45 tons of grapes which produce about 24,000 bottles of wine They also bottles a small production of port, brandies and soon a cognac-inspired brandy that will spend five years in the barrel and bottled in an elegant Chanel-inspired bottle without a label—only etched. A beautiful “cognac” from Radevic Estate will be released next year in this elegant bottle—sadly the first bottling is completely sold out by pre-orders. Later, he hands me a glass of the “cognac” from the barrel. It’s graceful and smooth; pure, and clean, one of the best tasting cognacs I’ve had. As I snap pictures, and the clouds move to the distant sounds of thunder, Goran explains his philosophy for his wine—and his life. He points to the vineyard just 20 meters away from where we stand. “My ancestors spilled blood on this land, I will not destroy it with these poisons,” his voice dips to a whisper, with passionate expressiveness. When the communists came to get her to sign papers to expropriate her property to the state, she met them with a gun. She refused to sign the documents and told the soldiers if you kill me I’ll kill you. When the state began restoring property rights to previous owners, it stunned them to discover the deed to the Radevic property was never signed over. 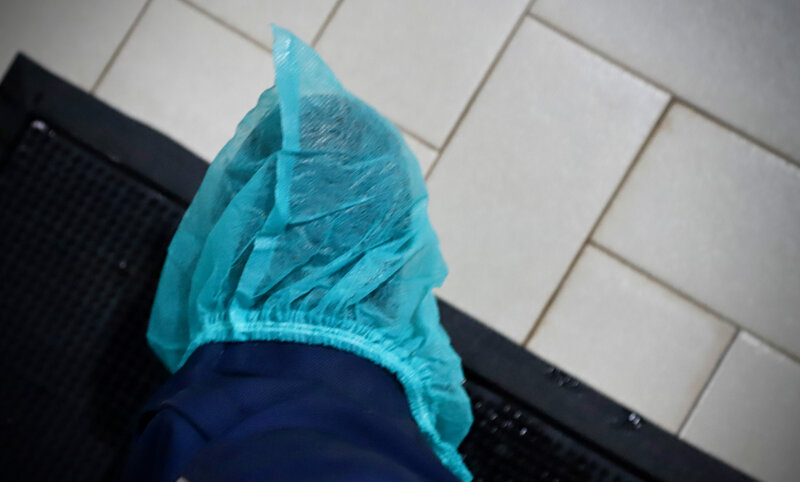 Is it Ivan or is it Goran who had the idea to ask visitors to wear antispectic medical-grade booties before entering the winery? Hmmmmm? I can see a bit of his grandmother’s toughness and insistence in Goran as he guides me through the wine cellar, fermentation and barrel rooms. But first, he hands me a pair of light blue booties, the kind that surgeons wear in the operating room. “It has been raining, and there are a lot of sheep droppings around here,” he explains and then blames his enologist and consulting winemaker for the insistence, though after spending so much quality time with him, I’m betting that is just his story— he’s the insistent one here. Goran is like a proud father as he walks me through the meticulously clean winery with towering sparkling stainless steel fermentation tanks, explaining the details and decisions involving winemaking, equipment choice, and environmental controls of his cellar. Goran tells me that the products he chooses to use in his winery are like the United Colors of Benetton: Bulgarian craftsmanship, computers from Italy, bottles from Italy, corks from France, corkwood from Spain, American Oak, and stainless steel from Finland. A boutique shop packed with great wine, brandies, and locally crafted products available at Radevic Estate. 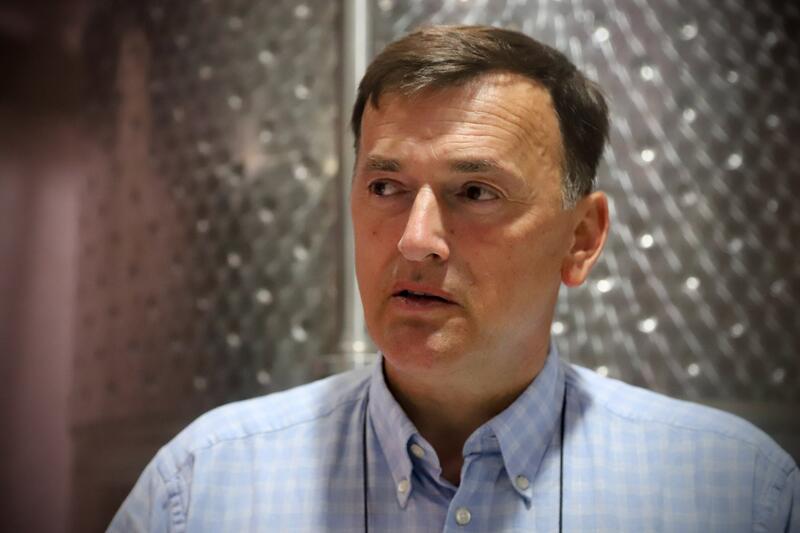 As we walk through the winery, with its state-of-the-art equipment, efficient design, and organization I can see Goran has invested significantly in his passion and dream. There’s a lot of love here, too. 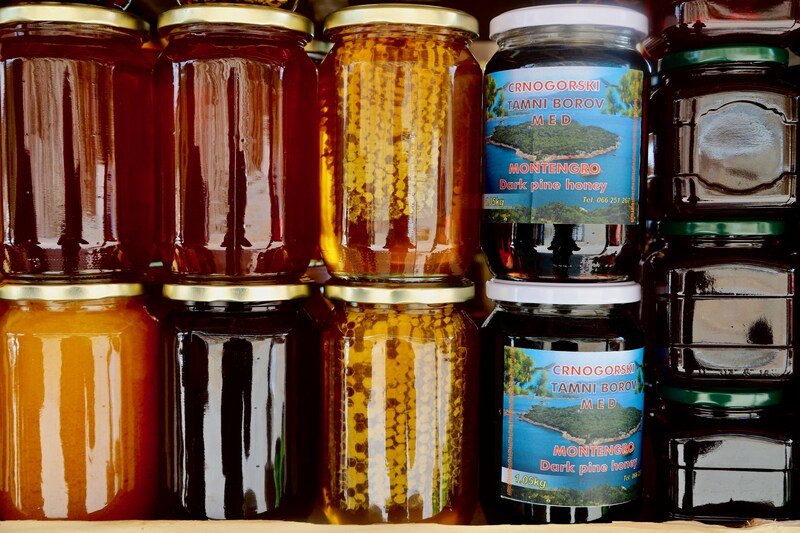 Renee Radevic is a beekeeper and through a small store on the estate she sells natural honey, oils, and health, beauty and handmade products made by neighbors and others in the community. Tucked into the back of the winery is a small humidifier with additional measurement instruments. It’s obvious this guy is serious about controlling the environment. This perfection and passion with such a low production could define what makes for a true artisanal and boutique winery. 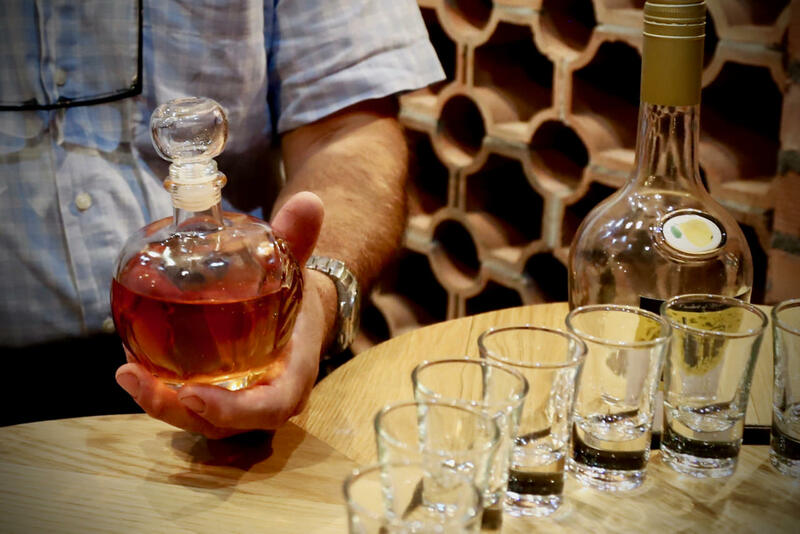 Before we taste wine, we must taste grappa—brandy—lovely! 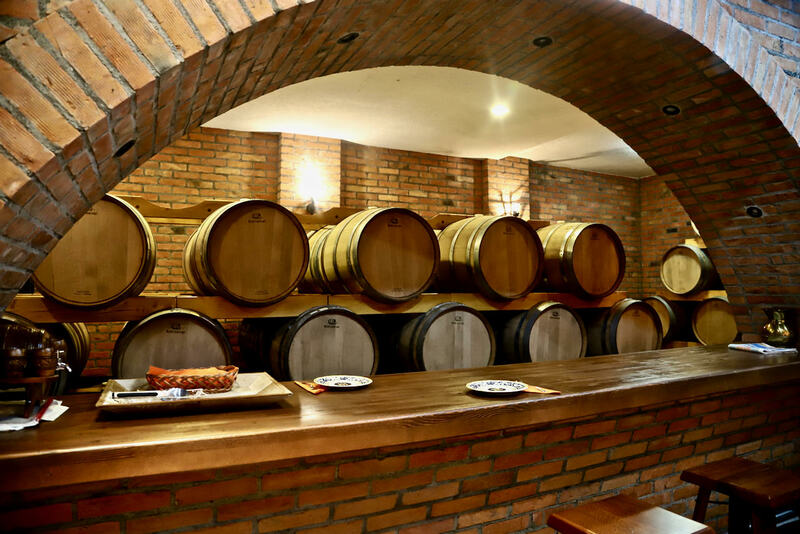 We walk into an alcove in the cellar designed for relaxing and tasting. As we pass a long row of barrels, stacked two high Goran points to the information that’s burned into the heads, or covers, of the barrels. 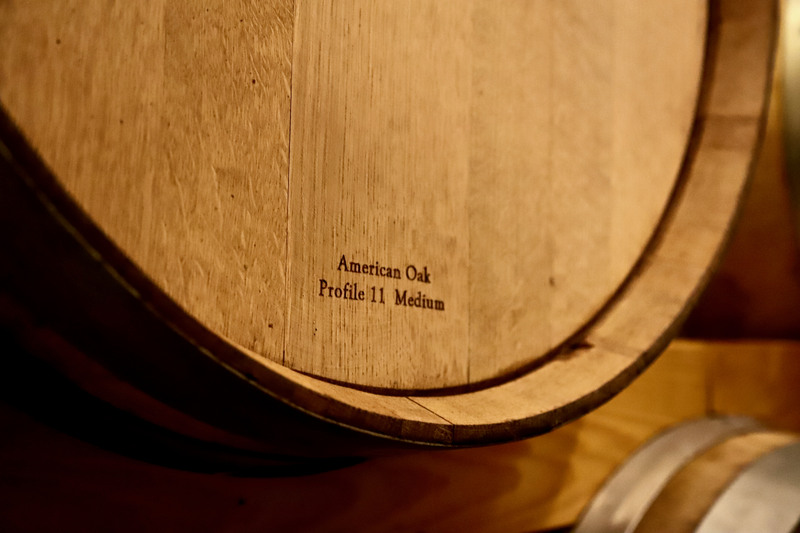 “These are number eleven,” referring to the profile of the barrel, or the amount of toast or oakiness that results from curing (burning) the barrels during the coopering process. He tells me that one (1) is the most toast or oak, and ten (10) is the least amount. It’s the toast that can impart flavor to wines during the barrel aging process. “I asked them to create a new profile for me—eleven (11).” He points to the number 11 burned into the barrel. 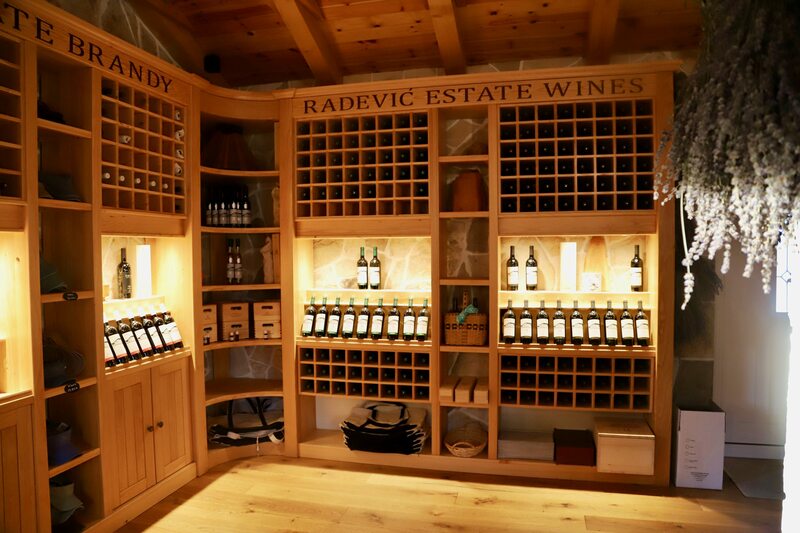 Radevic uses only American oak for aging its wines. We sit down at a circular table, and in the center is an elevated tray containing several bottles of brandies, also known as grappas, rake, or schnapps. 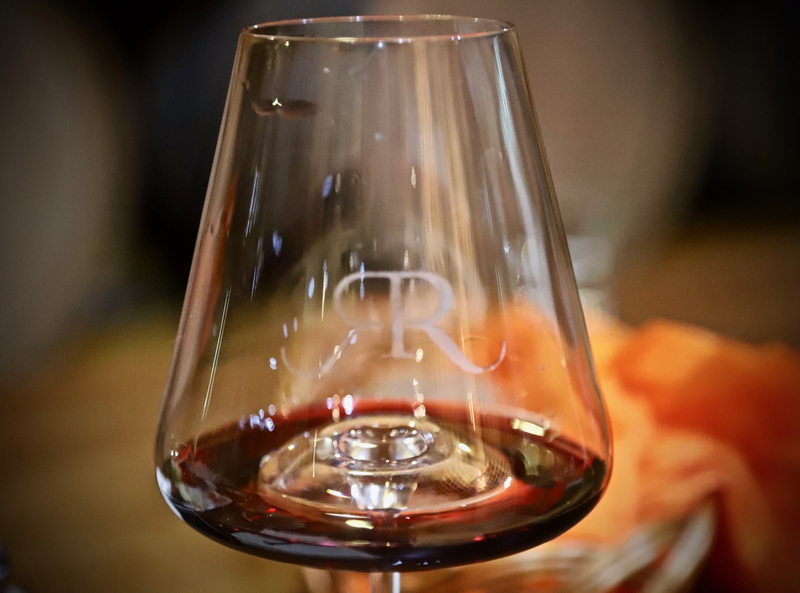 Radevic makes all its brandies from pure fruit: grapes, apples, plum, quince, and pomegranate. “My wife is a wine lover, I love brandy—grappa,” he asks me which I’d like to try first. It takes a lot of fruit to make just a few bottles of brandy. 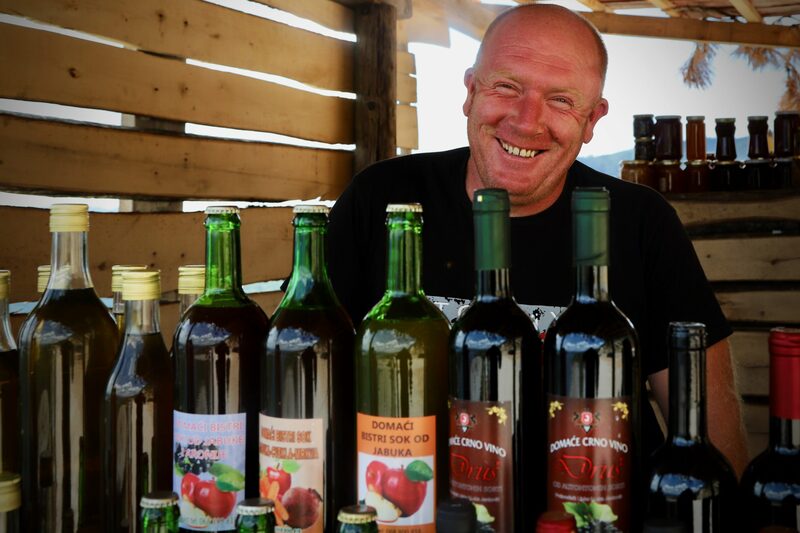 He sources the wild fruit from all over Montenegro, explaining that 2,500 kilograms of fruit (just under 3 tons) yield only 60 liters (15 gallons) of brandy. I try the apple, quince, and pear. 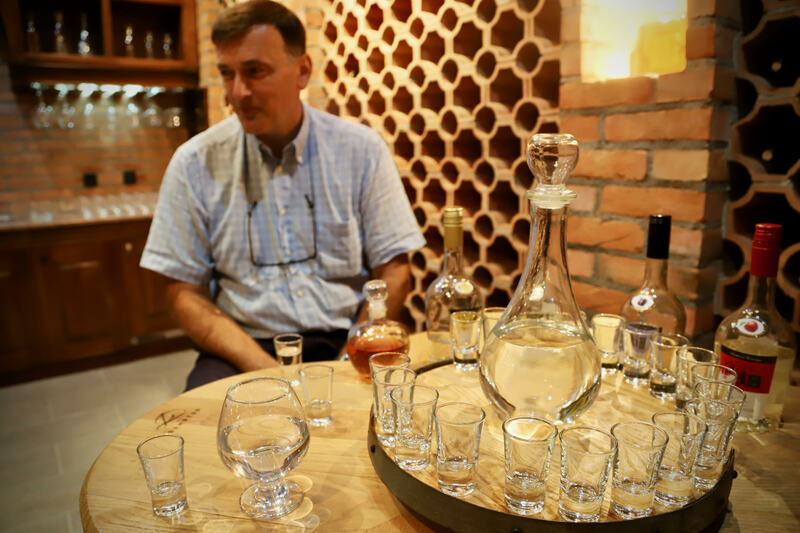 He uses wild pomegranate to make a liquor which clocks in at about 22% alcohol while the others are about 42%. In addition to the six fruit brandies, Radevic Estate bottles two white wines, a rose, Cabernet Sauvignon, Syrah, Vranac, two ports and soon that cognac. I love the family recipe and homemade pepper sauce/salsa! 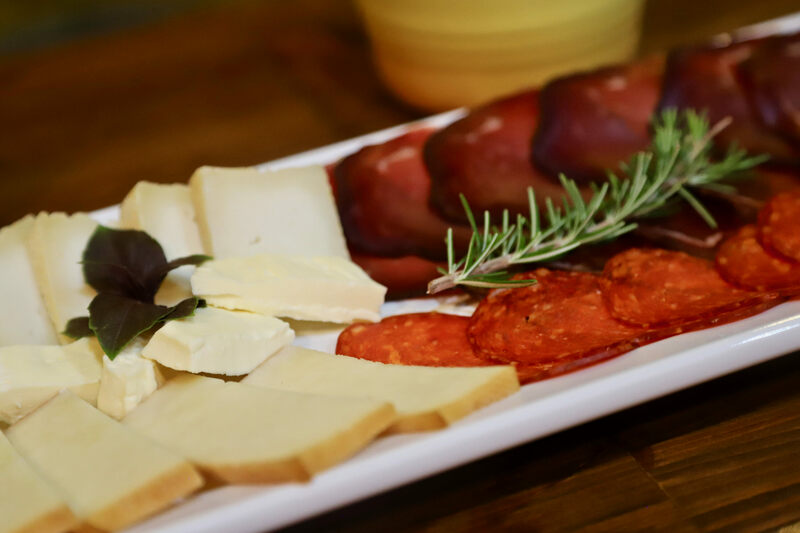 Goran shares a beautiful cheese and charcuterie plate made of all local products to pair with his excellent wines. The bottle and label of Radevic exudes quality and class. Custom-designed stemware made from lead-free crystal in Slovenia. 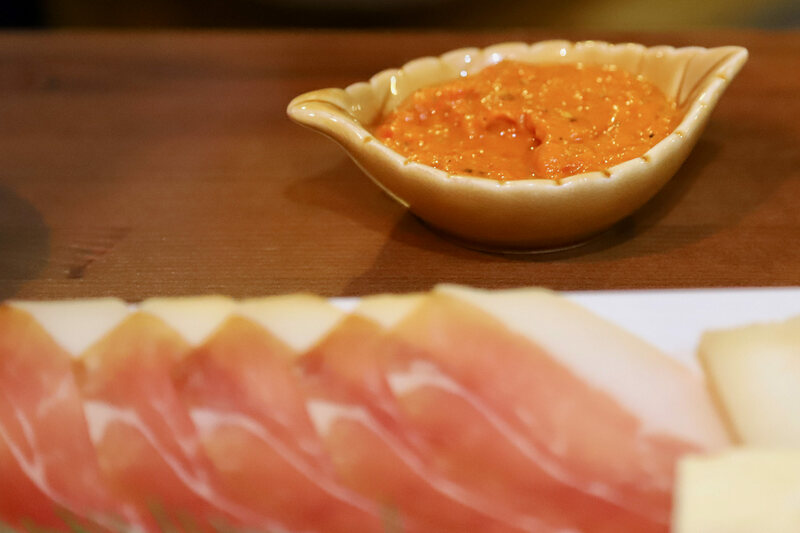 We move to a bar area that overlooks the barrel room as he pulls a tray of charcuterie, cheese, olives, bread and a delicious sauce or puree made from roasted peppers. We taste his wines from lead-free crystal glasses that are specially designed and manufactured for him in Slovenia. He pours me tastes of the wine but not for him. “Today my limit is three brandies,” he explains. The chardonnay is young and elegant. I’m most interested in the Vranac, which is an indigenous grape to Montenegro and the Balkan peninsula. It’s creamy, thick, and with lots of black fruit, berry, and spice and with a deep dark ruby color. 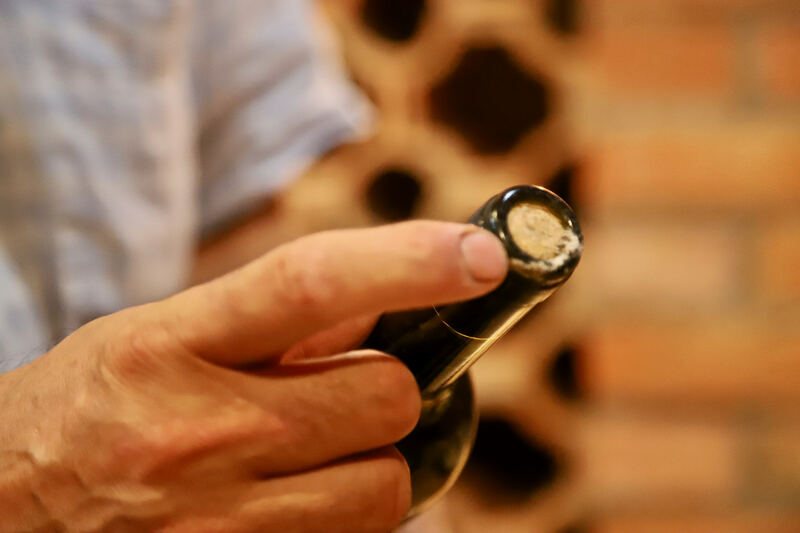 I explain I’m fascinated by the indigenous varietals and am pleased to find so many winemakers respecting the heritage of the farms, fields, and varieties. They export many of the Radevic wines to Europe and the USA. 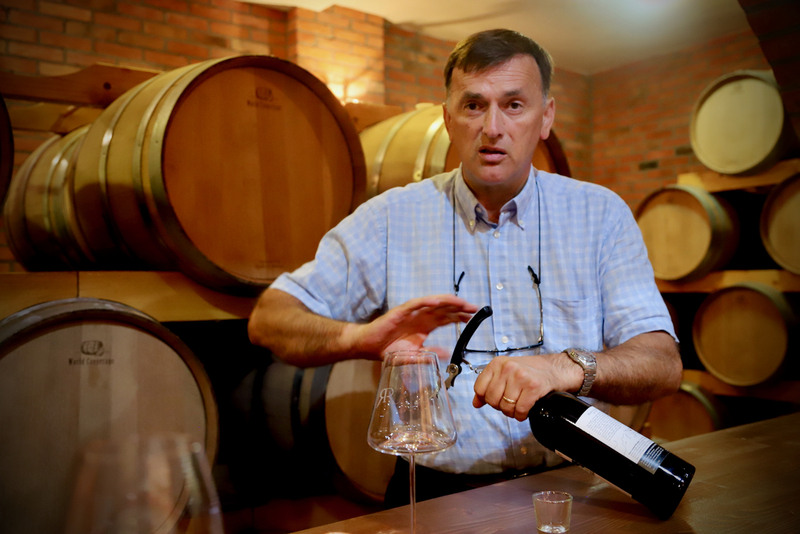 Goran explains that he took an early vintage of Radevic Estate to New York where a sommelier enjoyed the wine but suggested he upgrade the bottle and label. Goran hands me the original bottle and then the current bottle. The new bottle weighs more than twice the original and is embossed with the Radevic emblem, similar to the bottles of Chateauneuf-du-Pape. Everything is first-class at Radevic. And it shows. He shows me a special bottle of Vranac that is packaged in a wooden box. It’s a co-branded bottle that is exclusively sold at the Aman resort on the Sveti Štefan islet on the coast. Aman resorts are beyond five-star and cater to uber-wealthy, jet set, and celebrity clientele. With resorts all over the world, each location chooses a local product and packages it under the Aman brand name—everywhere except in Montenegro where the Aman name is shared with Radevic Estate. Aman Resorts, the uber-luxury resort group chose Radevic Estate Vranac as the ideal product to represent the culture of Montenegro. “They wanted my Vranac,” Goran explains, “but they didn’t want to use my name or logo. I refused. I won’t give up my brand—this is my life savings.” For two years the Aman lawyers battled with Goran and his lawyer. Radevic held strong, to its conviction. After all of this negotiation, Goran got his way. He points to the RR logo near the base of the bottle. 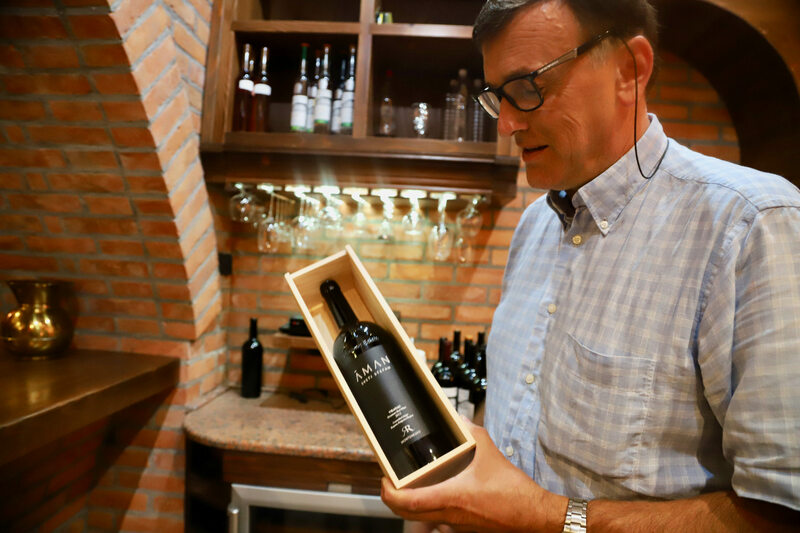 It’s a testament to Goran’s investment, philosophy, and passion that a five-star, high-quality brand chooses Radevic Estate Vranac as the ideal local Montenegrin product to showcase Montenegro. As we share stories, sip wine and brandy, I learn that a horrific accident that almost took Goran’s life just a few years ago. “How many people you know survived after getting hit by a train?” Goran asks. He picked up his daughter from flute lessons on a Saturday afternoon in 2014 when his car stalled on the railroad tracks just down the driveway when a train plowed into the car. The same railroad tracks we crossed just a few hours ago. “I used to be a heavy smoker,” he divulges. His right lung was crushed, was bleeding in the brain, broke all his ribs, his sternum, and his right arm was paralyzed. For eighteen days he was in a coma. His daughter, who was also in the car came out with just a cut and eighteen stitches. Today his right-hand shakes as he holds it up to show me. “I came back,” he explains the dangerous surgery that brought him back to life. “After this accident, I really see life is too short,” the conversation turns serious and then philosophical. “What is important, Allan is health. You cannot buy it, yet you start appreciating it only when you start losing it.” he continues. “The second thing, that’s important, is family happiness. Number three is having a few friends to share—that’s all you need—to share good and bad things.” We toast again. 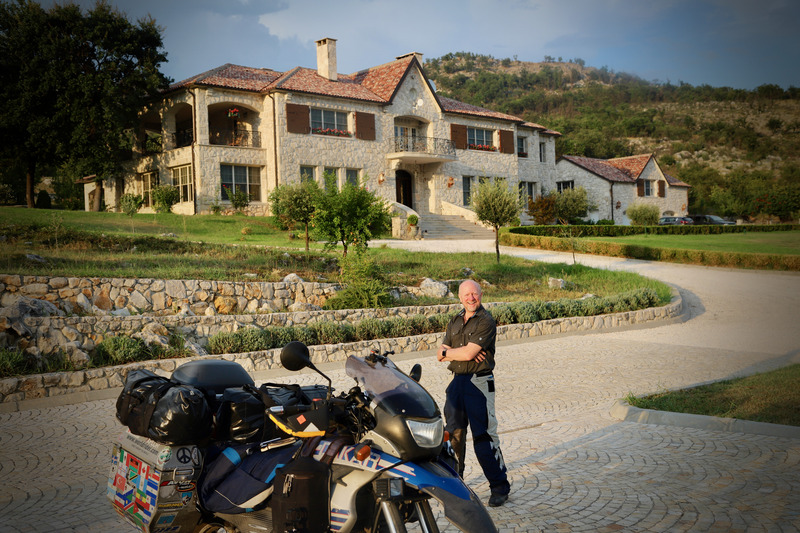 Doc and me outside the estate before Goran guides me to a nearby hotel and local restaurant in the capital, Podgorica.